Are you between 8 and 16? Do you want to improve your drama skills? Would you like to perform at Warwick Arts Centre? Yes! 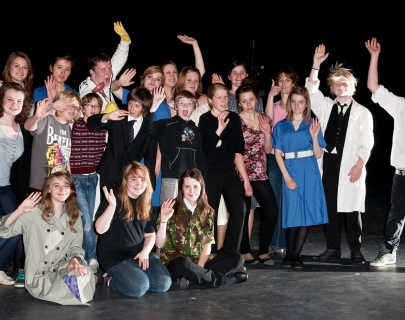 Then the Warwick Arts Centre Youth Theatre could be the place for you. The Youth Theatre is split into 3 groups by age and runs on Saturday mornings. The timings on a Saturday morning are as follows. The sessions cover a wide range of skills including text, improvisation, mime, Shakespeare, mask and music and of course lots of games. It also gives you the opportunity to increase confidence, make new friends and improve team work. We aim to organise one trip in the Autumn and Spring terms to see a professional show at Warwick Arts Centre and create original performances at the end of each term. In the Summer term, it’s all hands on deck to produce a Showcase for friends and family in one of Warwick Arts Centre’s Venues. Youth Theatre costs £55 per term for Saturday groups, and is paid via the box office before the start of each term (£165 for the full academic year). To join, please contact the Creative Learning Department on 024 7657 4786 / 7615 1793 or by email here.